At the end of 2013 when I was in a difficult and high stress position running the business sales team for a large technology company, I had the strangest dream. It was London 2012 and my dream persona had just won a swimming bronze medal during the Summer Olympics. I awoke, however, not with euphoria, but rather to the groggy realization that even in my personally architected fantasy world the best I could muster was a third place finish. I knew then that my work was numbing my spirit. A couple of months later, having taken a sabbatical from my job, I had another vivid dream, also set in London but in this dream the Church of England had just named me Archbishop of Canterbury (despite my not even being Anglican!). A few weeks of rest and perspective had nurtured my healthy self-esteem once again to full blossom. Dreams can tell us much. In English we use the same word “dream” to mean both subconscious sleep images and also conscious aspirations. In either definition, tapping into them is a powerful personal and professional tool, though perhaps not in the way most people think. For instance, a common question modern sales teams ask business customers is “what keeps you awake at night?” It is a well-meaning question but an undistinguished one. Through it we are saying, tell me what concerns you have and I will show you how my product or service will address them. Let me interpret your dreams. How different in the Biblical book of Daniel, when King Nebuchadnezzar has a perplexing dream and calls together his Chaldean magicians and sorcerers for answers. They ask the king to relate his dream to them so they can interpret for him (“what keeps you awake at night?”). But the Babylonian ruler would have none of that; anyone can make up an interpretation once they hear the dream, if they are truly gifted, he decreed, they should be able to tell him exactly what he dreamt: “if you do not make known to me the dream and its interpretation you will be torn limb from limb and your houses will be made a rubbish heap.” Stern stuff. Yet among my customers and colleagues there have been Nebuchadnezzars yearning to marvel at someone possessing the gift to ascertain and resolve their own unuttered dreams. In essence telling them, rather than asking them, what keeps them up at nights, and getting it right. I haven’t always gotten it right. Once when a product was performing poorly our salespeople across the country were quitting. The traditional corporate response was to pay better and reinforce how important their contributions were to the corporation. However, most regional salespeople dream of building a career for themselves and their families within their home communities, so their professional credibility with local customers was far more important to them than the company’s health or even their short term compensation. They needed the product fixed. Our response tapped into our own corporate dreams, not the dreams of our salesforce. We had failed to discern that. Nick Bottom, the comical weaver/actor wakes from his enchanted sleep in Shakespeare’s A Midsummer Night’s Dream to say “I have had a most rare vision. I have had a dream, past the wit of man to say what dream it was.” But of course, Shakespeare had the wit to say precisely what the dream was and its telling became one of his most popular plays. If we have the wit to discern the dreams of those around us it can be just as magical. But that wit is an exceptional combination of intuition, empathy, intelligence and quiet. That is the real “rare vision” few of us get to experience. You see it at intersections every day. When the traffic signal turns green the first car slowly pulls away while the next car in line remains until a safe space has developed and it then eases into the intersection. The third car is slightly more confident of the traffic flow but it too allows for a gap before proceeding. The process repeats itself down the line of vehicles until seconds or even minutes have passed before the final car begins to move. This despite the fact that every single driver sees the light turn green at exactly the same time and could, theoretically, all proceed simultaneously. But drivers are cautious in a line of traffic precisely because they cannot know the intentions of the vehicle in front of them. Is that person going forward as expected or will he suddenly stop, abruptly change lanes or make an un-signaled turn? We slow the pace of acceleration to avoid a potential wreck. This may be the story of your company. The senior executive team unveils a major new priority with clever communications plans but when the signal is given to go, the organization’s response is sluggish. Top managers embrace the fresh agenda but middle managers and individual contributors creep along with a wait and see attitude, deadening the pace of change. Perhaps there is a lesson for us in those roaring NASCAR race cars traveling 200 miles per hour, side by side, with only inches separating the tail of the leader and nose of the pursuer. 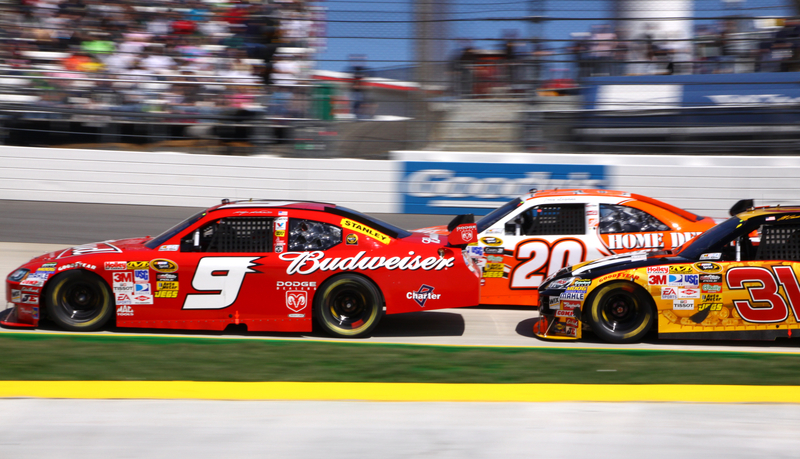 NASCAR drivers travel at astounding speeds by maintaining a shared direction and a common goal. Every driver knows where everyone else is headed. While they may jostle for position there is little concern that the driver ahead is going to suddenly slam on the breaks or make a right hand turn. Like street drivers at an intersection your employees may well be waiting a safe distance until they see their manager really commit to the initiative. They may have been so burnt by repeated abrupt changes in strategy, process or org structures that their adoption intervals are becoming larger not smaller. What’s worse, their dawdling response to a new program may be perceived by the business as an indictment of the merits of the initiative itself, leading well-meaning senior executives to replace it too soon with yet another project, only reinforcing employee skepticism about the staying power of programs. Change agents may be the popular business celebrities. But there is an equally true business case for stability. It enables organizations, like race car drivers, to accelerate with confidence toward a common checkered flag. By affording new initiatives their full lifespan the organization actually grows less cautious about committing to change in general. This enables truly good ideas to succeed faster, and it also causes poor ideas to fail legitimately, that is from poor conception rather than slothful execution. Reducing the time to true success or legitimate failure saves a company money and resources. So the velocity of change should not be measured by the raw number of initiatives but rather by the discipline of the organization in committing its human capital to them. That discipline happens when the organization’s history does not include abrupt turns in the middle of the race. Pay attention the next time you are the last car in a line of traffic at a signal. Watch the behavior of the drivers in front of you. If your job was first and foremost to get as many vehicles through the intersection as possible during a green light cycle, what creative ideas might you come up with to make that happen? Are there analogues for those ideas that could speed the pace of change in your business or organization?